The word “hybrid” was first used hundreds of years ago. When two animals mated (say, a pig and a wild boar) they created a hybrid. With cars, the word has almost lost its meaning. There are plug-in hybrids like the Ford Escape, electric cars with gas engines like the Chevy Volt, mild hybrids like the 2012 Buick Lucerne, and a wide mix of “full hybrids” like the Cadillac Escalade Hybrid. Most of these cars have either two motors (one gas and one electric) or electric assistance in the powertrain. 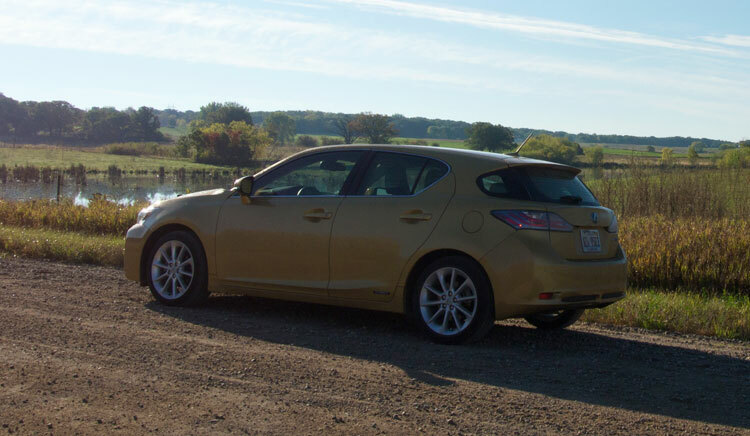 The Lexus CT 200h is a hybrid of a hybrid. Based on the Toyota Prius platform, this sporty luxury car is normally pitted against the Audi A3 or a Volvo C30. The styling screams compact racer, the fuel economy of 43MPG in the city suggests an economy sedan, but the luxury appointments (e.g., headlamp sprays and park assist sensors) place the 200h in a completely new category. Yet, whatever you want to call it, the 200h is fun to drive despite its poor acceleration. For the true technophile, the CT 200h is one of the most interesting computerized machines around. First, a bit about styling. In some ways, the low-to-the-ground stance puts the 200h in direct competition with the C30, which has a similar look. During our test, quite a few young adults and teens crowded around the car for a close look, gawking at the angular lines. There are hints of the C30, with an elongated shape that recalls the 2012 Ford Focus. The eye-drop front lights are eye-catching and there’s a rear spoiler that has a touch of Subaru about it. The design is unique enough that we were asked a few times if the 200h was some sort of import (well, it is) and if it was even available yet. Inside, the stitching is first-class all around. And other accents show just as much attention to detail. When you switch between sporty and normal mode, the interior lights and the dash turn red (for sporty) or blue (for normal). Strangely, someone forgot to make the interior go green in Eco mode. That might be an addition to the 2012 version. The stereo is top-notch, but did not create a sensation of surround-sound. The bass thumps like a small car should, but will not be shaking any plates off the wall at grandma’s house. How do you want to drive today? The real draws here are the hybrid drive modes. Experimentation is key. You can try the sport mode and see if you want to sacrifice fuel economy for extra pep. Or, you can drive much more economically, braking slowly and never racing off the starting block to save fuel. This makes for an engaging drive experience because there are so many different ways to drive the vehicle. The 200h doesn’t just show you average MPG – there’s actually a bar graph with your MPG history. You use a mouse pointer to move around the flip-up LCD screen. And, the smart engineering behind the continuously variable transmission (CVT) means the car can effortlessly switch between a sport mode with exhaust fuming out the back or an all EV mode, ala the Chevy Volt (but only at low speeds). That’s the most fascinating spec on the 200h. 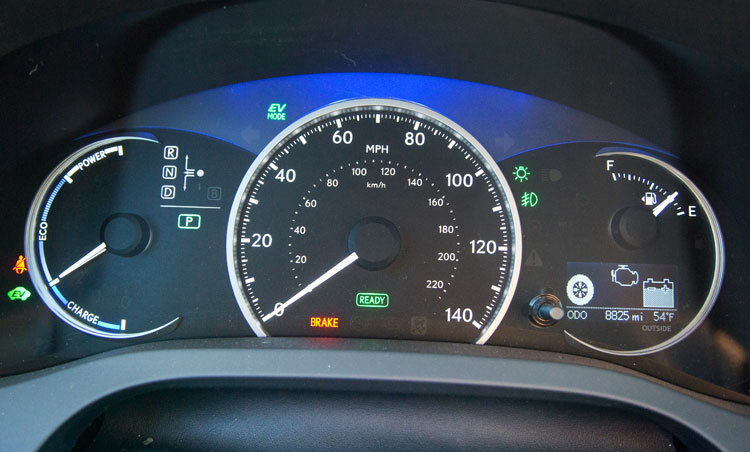 A large EV button in the center stack engages only the electric motor to propel the vehicle. The silent glide reminds us of a Nissan Leaf. There are quite a few conditions when the EV mode will disable itself automatically: if you go too fast, push too hard on the accelerator, or even just use the battery too long and deplete the power. Talk about driver distraction. Part of the reason the 200h is so fun to drive, at least for techies, is that you can constantly monitor the EV mode, watch as your MPG slips up past 60, and wisp silently around town. During one afternoon test, we managed to keep EV mode active most of the time. Helpfully, the 200h also switches automatically to EV mode whenever it can, including hill descents and when you stop at a traffic light. There’s also an engine brake mode, marked with a B on the shifter. In this mode, the acceleration is even less pronounced and the engine itself helps slow the vehicle. This is almost like an exhaust brake on a diesel truck. When you come around a corner and ease off the accelerator, the car assumes you want to slow down quickly. You can continue forward movement without braking. If you do brake, the 200h uses that energy to charge the battery, but of course you’ll need to use it to get going again. When you take the 200h out on the highway, things start to change. For one, the 0-60 rating of just over 10 seconds makes the 200h seriously underpowered, if not even a little dangerous for passing. There just isn’t any heft here. The engine is rated at 134 horsepower, and you’ll need every horse. Oddly, the driving experience feels a bit like adding boosters to a shopping cart, and we mean that in a good way. You’re going to accelerate slowly, but the low-slung styling and responsive steering means every corner is just a bit more engaging. We’d agree with some reviewers who dismissed the 200h as underpowered, but the 200h was never intended to beat an Audi A3 at the track. It just looks that way. Trunk space is just average for a small car – not slim, but not exactly roomy. We crammed in three large soccer bags with no problems. Passenger space is also just average. A teen found there was enough room to stretch out a bit in back, and everyone had enough head space. Part of the reason the car feels a bit roomy inside (at least for a small car) is that it is so low to the ground. That meant leaning to get ito the car, but once you are in there’s plenty of headspace. 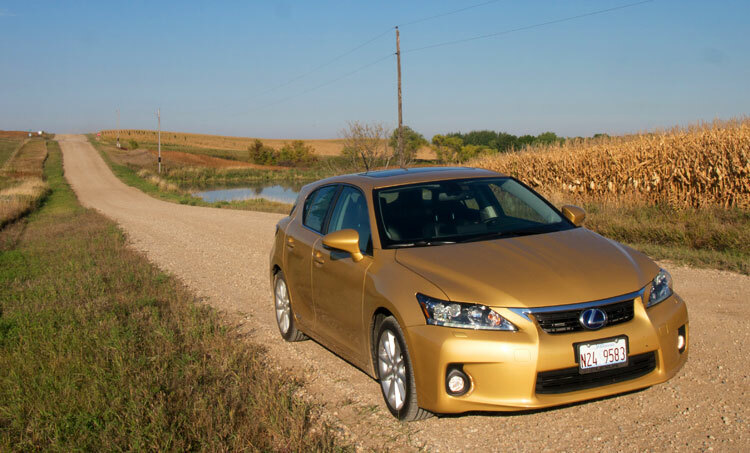 Like one of our other favorite rides, the 2012 VW Jetta, the Lexus CT 200h was hard to give back after a week. The main reason was due to all of the tech features – they make you want to drive more and push the MPG rating or get the EV mode to last as long as possible. Interestingly, on the last day of driving, we also found that the car was just as fun as the Nissan Juke and C30 at zipping around corners, driving with reckless abandon on open roads and flying into parking open spaces. This is one of those “yes we’d buy it” cars that matched up well with our interests: the EV mode and engine brake modes, the sporty drive, tight handling, and a good stereo. 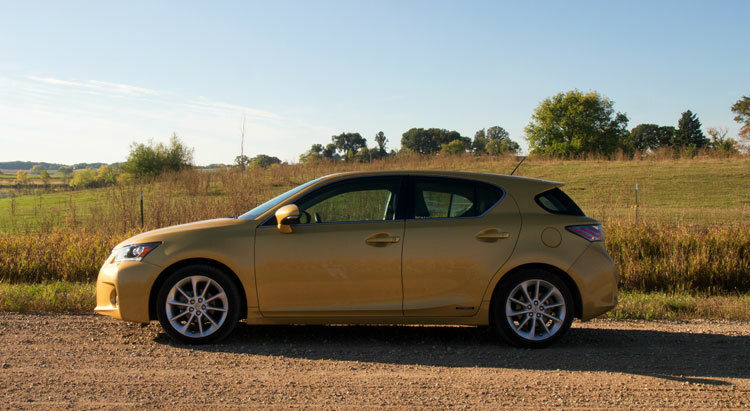 There’s a high cost for this “hybrid of a hybrid” approach – the CT 200h costs $29,120 base (our version was $38,000). But after driving 30 to 40 cars over the past 10 months, it’s unique styling and eco features made it stand out.